When I think of the contents of my ideal wardrobe, I picture something like this: I open the doors to a neatly hung and folded small selection of clothes, all of which I like, all of which I wear, and all of which I have worn recently. I have a clear idea of what matches what, and actually most things match a number of other things. Choosing an outfit is easy. I enjoy wearing the things I own, and they make me feel good. This, however, is my reality: I open the doors to a wardrobe with shelves stuffed with messy piles of various clothes that I can’t really see, plus a rail with a jumbled assortment of things. I have only worn half the items I own in the past 9 months. Many of the items are too small, the product, I suspect, of working long hours behind a desk for the first time in my life, which hasn’t fared well with my love of baking (and eating). I’m never entirely sure of what goes with what, and I spend far too much time trying on and discarding outfits, before leaving the house flustered and grumpy. Most of the time I imagine I look like I’ve pulled an outfit together from the jumble sale, and that doesn’t make me feel great. The contents of my “minimalist-in-the-making” wardrobe October 2015. I’m very clear about what I want, but how to get there? This is my ongoing struggle. It’s been a while since I tackled it, and feeling inspired by my recent decluttering success I decided I needed to make the most of the momentum, and give it another shot. 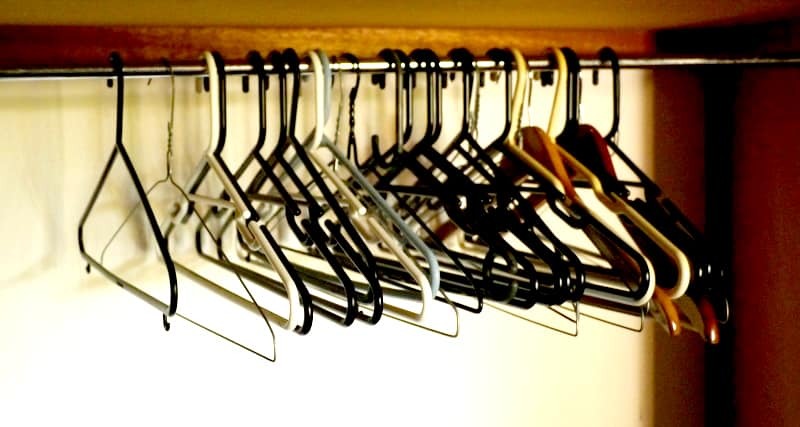 At the start of the year, I conducted an experiment to find out how much of my wardrobe I actually wore. The idea was, I tied a scarf to one end of my wardrobe and as I wore things I put them the other side of the scarf. I was planning to review it after 3 months, but then it was autumn and the weather was changing…and I hadn’t worn much of what I owned, so I extended it by another 3 months… and then a bit more, it seems. It was 8 months when I finally looked at the results. It’s clear from this that I probably own twice what I actually need. I only wore half the items in my wardrobe! When I started the challenge I had the idea that I’d discard what lay beyond the scarf, but then another idea came into play. Marie Kondo says you should only keep things that “spark joy”. As someone passionate about zero waste, I think I have a different idea about of “sparking joy” to someone who enjoys shopping and puts great pride in their appearance. That said, it did make me realise that several items in my wardrobe that I wear regularly do not spark joy. I don’t feel good wearing them. They sap my confidence. I keep them only because I don’t want to send them to landfill. I also realise that many of the items in my wardrobe that do spark joy no longer fit. (Or maybe I mean did, and would.) If you told me now that I’ll never slim back into them, I’d probably get rid of a quarter of my wardrobe. I know you should never keep clothes that you intend to slim into as it rarely happens…but I really want to believe it will with me! I’m still deciding where the balance lies. The weather here is just changing to summer, so there is still the opportunity to wear winter clothes for a few more weeks. I want to give myself the benefit of the doubt that eating less cake will mean my summer skirts fit once more. I didn’t let the excuses stop me from going through everything in my closet, however! I removed another 30 or so items from my wardrobe: the things I disliked the most (even if I still wear them) and the things I know in my heart I will never fit into, or actually wear even if I did. That means my current wardrobe count is around 105 items, including underwear, socks and sportswear. This time last year it was 139, after a big decluttering effort reduced it from 169. Now I’d love to hear from you! Is wardrobe decluttering something you struggle with? What are the reasons you hold on to things? Are there any excuses you tell yourself? What are the best tips you’ve found for letting go? Or do you have a minimalist capsule wardrobe? How did you do it? What are your tips? Anything else you’d like to share? Please tell me your thoughts in the comments below! I’be been taking part in Project 333 for the last year (33 items of clothing plus accessories every season). In some ways it has been a revelation. I now find that everything I have in my wardrobe goes with everything else. It was especially helpful for holiday packing this summer. However I have to admit I am now struggling with the restrictiveness of it and am not so sure it matches my personal, sometimes quirky, style. 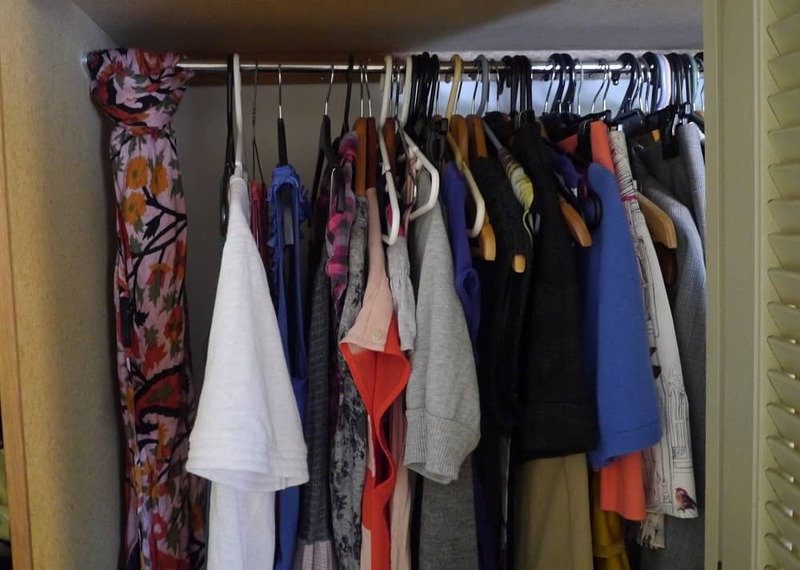 Living with a pared down wardrobe filled with only the things you actually wear does make life easier and stops those impulse buys that don’t go with anything else. Good luck with finding a wardrobe that works for you! I’ve read about and been recommended Project 333 many times, but have to confess I’ve never tried it. I think probably I wasn’t ready to see the results – that actually, I could manage with far less than I currently have! What do you think your ideal number would be? A year ago, when I decluttered from 169 to 139 I thought getting to 100 would be good. Now I can see that is still far too much stuff! 33, I don’t know. As someone with experience, what do you think?! I did Project 333 years ago and loved it. Now I have slightly more in my wardrobe – maybe 33 items of clothing, not counting shoes, jewellery and accessories. I swap my wardrobe twice a year, not four times. Most of my clothes now go together, or at least much more than before. I, too, had concerns about maybe rmissing certain items once it’s too late and they’re in the charity shop, but no. I’ve never looked back. There’s no way I could be bothered swapping my wardrobe 4 times a year, that’s for sure! Twice sounds more reasonable. And probably fits with the seasons better here. That has to be the key – stuff that goes with other stuff! Great piece! I empty everything a few times a year and try everything on. I’ll sell or give to charity any awkward things that I regularly put on and take off, put aside anything that doesn’t fit or needs fixed and repair it or move it on. It really does make getting dressed easier because I’ve taken out the things that cause problems! It definitely does get easier to slim things the more you do it but there are still things I have a soft spot for that I don’t wear offer but I love that have stayed! Is it comfortable? I’m getting much more ruthless with this now that I don’t work in an office and need my clothes to be practical! Thanks Louise! I love all your tips! I’ve definitely learned that comfort is important – even in an office, what’s the point in wearing clothes that are uncomfortable? They may look good but if they don’t feel good what’s the point?! I am also heading down the path of having a capsule/rather pared down wardrobe. I have found that I was better at giving away the things I loved and didn’t fit in when I became more accepting of myself at my current size. Also when I thought of the times I have found something in an op shop that I loved, and if I kept things in my wardrobe for ‘someday’, that I was depriving others of enjoying these pieces, and I was hindering myself. I’ve been more ruthless with things that fit in the last few weeks, and it feels so great to be giving them away =). You can do it! I also find that going through my wardrobe, or a section of it every week or two allows for more paring down, and keeps the motivation up. Thanks so much for your encouragement Bob! I definitely agree…when I think about someone else loving what I own but rarely wear, and wearing it every day it makes me realise that my keeping it is a waste. This is quite a new realisation for me…but a helpful one! Accepting myself at my current size…yes. When I decluttered my wardrobe I’d just got back from a holiday and was feeling a little unhealthy, but in truth losing those couple of kilos is one thing, wishing I could fit back into jeans I last wore two years ago is something quite different. Acceptance is the key. Even writing this post makes me realise that…it like that old saying about needing to hear your own advice! I know what I’d say to others so I need to apply it to myself! one Thing that helps me is removing everything ruthlessly, just putting back what I really love and then instead of throwing out the remainder putting it in a box. I put a date on it and discard of it (meaning selling, give to charity or the like) once I am confident I can live with what I put back. I have one bag of too small clothes waiting on be dealt with… but at least they do not clutter up my wardrobe anymore. But you’re right. I need to be honest with myself! After all, the aim is to be with less, so what exactly am I worried about?! I guess that when you put everything that does not fit now and/or is not good enough to wear comfortably in a box and leave it for a couple of months, you can take things out if needed. That way you keep the possibility to change your mind. If you don’t use the clothes in the box you can safely remove them from your life. When you just keep the ‘good stuff’ it is easy to see where you need additional clothes (that actually fit at this moment). This is so true Sasha – I’m realising after writing this and reading the comments that I’m holding onto way to many things I don’t wear, and actually don’t really want to wear! If I owned a small selection of things I absolutely love and wanted to wear every day, that would be so much less wasteful than keeping lots of things I don’t really like and forcing myself to wear them now and then to alleviate the guilt! I also have this “does it spark joy” test, but whenever I shop I ask myself : “If I was a cartoon character would I be drawn wearing this?” Haha, it’s sounds a bit weird, but I’m a comic artist, so it makes sence to me. It means if this new piece of clothing is capuring the essence of me (my style). If I just really like it, but it’s not my style, I would not wear it eventually (even if I like it). When I buy I try to imagine my other clothes and match the new one with them ( that doesn’t always work out ). I recently did a ruthless decluttering of my summer wardrobe. I used to cling to some clothes that I really liked, but didn’t wear, but I realised that I’d be super happy if someone else really liked them and wore them. I love the idea of exchanging clothes with friends. I like your analogy Milena! The “spark joy” test is a new one for me, and I think it’s really helpful…like you say, far better that someone else likes and wears the things that languish in my wardrobe, unloved! I’m definitely more aware of matching items now too – no point buying something beautiful if it doesn’t go with anything else and therefore will rarely (ever!) be worn! I’ve just embraced the sustainable, natural fabrics approach. In my journey to be zero waste / plastic free, I’ve realised I need my clothes to be biodegradable too! Generally I buy second-hand, but now I’m transitioning from Made in China polyester, I’m open to the idea of buying new from sustainable ethical independent brands. Did that recently and ended up with three plastic wrappers though – hadn’t bought clothes in so long I’d forgotten that’s how clothes are packaged! Enjoyed reading this! I try to apply the WIlliam Morris quote “Have nothing in your house that you do not know to be useful, or believe to be beautiful” to my wardrobe as well as my house (I wrote a bit about that here: https://papiermachethoughts.wordpress.com/2015/05/21/decluttering/). I guess that’s a bit like ‘sparking joy’ plus having a few practical things that won’t spark joy in me to be honest but are useful to wear for for running/walking/sailing etc. I suspect it is a habit to learn and, as you say, gets easier each time! I love that quote, and wonder why I don’t apply it to my closet?! I guess “sparking joy” is relative. I don’t love my sportswear either, but the idea of not having to exercise in jeans sparks joy…does that count?! Cheers. It’s nice to find other bloggers out there passionate about this stuff! what ever how ever you pare down I recommend the one in one out rule. If you buy something something has to go. EVEN stuff from the opshop. It means you really consier each purchase ie “what would I let go of to have this in my wardrobe. And gradually you do end up with a wardrobe that sings . . . .
I’ve been trying to use the one-in, one-out rule for a while. There tends to be a bit of a lag between arrival of new thing and discarding of old thing. Definitely not perfect, but I agree, it makes me think long and hard before I add anything new (new to me)! Think you’ve touched a nerve with many of us, Lindsay, I know it has with me. A few years ago, I took a Wardrobe Refashion Pledge for a year. Nothing that wasn’t recycled, locally made or made by me. Taking part in a public and shared commitment was a real inspiration. I also enjoyed setting up clothes swaps. It was effective to a point, but it had its flaws: it didn’t involve dealing with what I already had (too much), and the op shop clause was too big a window since I was my son’s driver for his op shop trawls for books for his stall once a week. I ended up doing a paid program, Shop Your Wardobe, which was much more strict – no new clothes whatsoever, not even new socks or undies. And really made me rethink what I own, much as you have. I don’t have a strict regime of turfing things out though, as I sometimes don’t wear something for a couple of years and then rediscover it and it becomes a regular again. My criteria are more about items not being ‘orphans’, needing to fit well and look good. It also got me into making and mending, which is a journey that I truly value, not just for the skills, but also for the awesome people it has brought into my life through the Make New & Mend group. Hi Lesley – yes, wardrobe minimalism is like that I think! The Wardrobe Refashion Pledge sounds interesting, although I think I’d need some basic upcycling skills to participate myself! I’m following a No New Clothes group on Facebook currently but I’ve realised that my issue isn’t ‘not buying new stuff’, it’s getting rid of stuff, and ensuring the things I have are useful and practical..and not orphans, as you say. I might end up getting *new* stuff if it means I’m more likely to wear the stuff I already have. I also agree with the sentiment that just because you haven’t worn something for a couple of years, it doesn’t mean you won’t again. I think that relates to being an orphan, again! If I’m not wearing something because it doesn’t really fit, or I feel self-conscious, that probably won’t change. If it’s because I have no shoes (or whatever) that match, or because I haven’t been anywhere where it’s appropriate, that’s a different issue. Yes… That’s my problem. I think I am going to fit in some of my clothes. Or I keep them because I am hoping to get an office job, same with shoes. Those clothes and shoes fit me well but I work in service industry where I don’t wear them. Ah, Edita… isn’t it frustrating?! I know I shouldn’t keep clothes I *might* fit into, but I do. Actually, I did just list one of the skirts on eBay today, so I guess that’s a start. It’s a skirt suit! The skirt fits, but is too formal for anything except interviews I think! here is a chance to plug re-skilling. if you could sew, you could refashion thrift store finds or clothing that doesn’t fit. you could even make your own–the ultimate wardrobe spark of joy. I can just about guarantee that you will care for garments you have spent hours designing and making better than the other clothes you own. When I reviewed why I got rid of things, it helped me buy better in the future. So I make sure what I have, mostly suits work, which I do more often than other things! I noticed I like blue tones and black/white, and now there’s very very little in colours like yellow, pink or red (an item or two in these colours). I’ve also tried (during a boring shift) to ‘remember’ all of one category of clothing. What I forget I figure I don’t need, if I don’t remember. Even if I end up keeping items, it talks to me to think more heavily about those items. Just some things you could try! Hi Sarah, I definitely agree that this process will help me buy better! Realising why I don’t wear the things I own, realising that I hate sending synthetic fabrics to landfill, realising what styles suit me and what styles don’t will all help me make better choices. Interesting that you mention colour, I had a couple of emails from readers who suggested looking into colour palettes, and saw a blog earlier this week about the same thing. It’s something I’ve vaguely thought about but definitely something to look into more. Hmm, I might give the “remembering” test a go! I think that will be an interesting reveal! – Remove what doesn’t fit. You don’t have to dispose of them, but if you’re not able to wear them, they shouldn’t be in your wardrobe cluttering your brain whenever you look at them. – Remove what you’re not wearing. You know there’s lots of places to gift these pieces, they don’t have to end up in landfill. Op shops, clothing swaps, shelters, friends are all great options. – Consider what categories you’ve got. You may have 15 pieces, but if 10 of them are skirts, your outfit options are limited. Have a look at what kinds of clothes you have, and consider what building blocks you need to give you a good range of outfits. 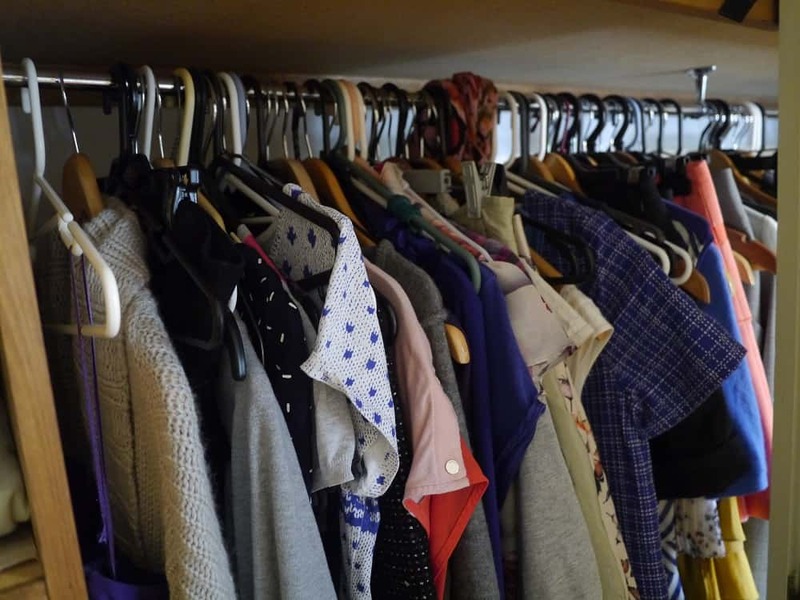 You can have a look at my category lists to help you get started, but naturally what suits you might be different: http://reducereuserecycle.me/2015/07/02/auditing-my-wardrobe/ Interestingly, last time I decluttered these ‘limits’ really helped me finally release some of my excess clothes. Too many skirts is definitely a problem I have less of now! – Once you have a sense of how much of everything you want/need and what colours and shapes you’re looking for, you’re likely to become more aware of the ‘holes’ in your wardrobe. I find these holes are the core reason behind flustered, undecisive outfit planning. Of course nothing looks right, I’m missing a key component that would pull it all together! (Kinda like trying to bake a cake without any form of fat. You’re gonna get a disappointing outcome). Make a list of what items you need, in what kinds of colours and even what styles (if you can identify in that much detail). This is now your shopping list. – I chose to prioritise actual holes in my wardrobe, I tend to put replacing pieces I don’t love but that still fill a key role on the backburner. I suspect because waste is a concern for you, this strategy may also work for you. But whatever, have a priority list, and then start identifying how you’ll find those pieces. I’ve taken 10 years to do this, I’m not speedy! I found I can find most items at op shops if I’m patient enough, although quality is sometimes an issue. A friend recently told me that second hand fairs often have better range and quality than second hand shops, so maybe that’s an option for you. – Even though you don’t love fashion, it’s still possible to love your clothes and what they can do for you. Hold up your favourite pieces and remind yourself where they came from, how long you’ve had them for, what key points in your life they were part of, what qualities you love about them. – Challenge yourself to find as many great outfits as you can out of your current wardrobe. Accessories are your friend here! Do it all at once with a friend on hand if you like, it sounds like you’d enjoy having a second opinion. Take a photograph of the outfits you think work, so you can refer to them later when you’re feeling out of ideas. Try combinations you’d never think would work. Wear them for a day and then decide if they’re ‘you’ or not. This is an exercise I’ve wanted to do for ages actually, wanna do an instagram challenge? Sorry for the delay in replying to this… all your helpful links made it look like spam to the filter, and I’ve only just fished it out of the bin! The “what doesn’t fit”… I know what I should do with this. Even if I want to lose weight, I’ve been giving myself “three months” for a lot longer than three months. Even as I wrote this, I knew what needed to be done. 3 items on eBay and more to be listed at the weekend. I think that not thinking carefully about the gaps is where I’ve been going wrong all this time. I like bright colours and quirky designs but they are hard to pair with other things, and I end up with items I don’t wear because I have nothing to match. I’ve had a goal not to buy anything new, when actually I probably need to buy *new* to fill the gaps, and discard the “orphans”, as Lesley called them in her comment! Consider it stolen! ; ) You’re right, learning to declutter my wardrobe has been much more painful and taken much longer than I could ever have imagined – but when I get there, it will be so totally worth it! Such a timely post, Lindsay! I have not bought new clothes in ages (about a year I think, except from four pair of socks and two pairs of woolen winter running tights), but now that I have almost nothing left to wear, I have been thinking about how to tackle my wardrobe. Of course I want it to be filled with sustainable/green/secondhand/plasticfree clothing, but it always take so much effort to find such clothes. Will look into Project333 too, maybe it will help me get organized. I’m intrigued…when you say you have nothing left to wear, is it that you actually own nothing, or more that it’s nothing suitable / practical / that you actually like?! Agreed also about the effort part! I thought I’d just buy nothing new and use up what I had, but after 3 years of this I’ve realised I still have far too much, and now I need to rethink what I actually wear, and maybe get *new* things if it helps get more wear out of what I own. PS Let me know if you sign up for Project 333, and how you go! Well that was the plan actually Helena!… to take everything to the right of the scarf and take it to the charity shop! But then I realised, some things to the right of the scarf I like, but don’t wear because I feel I should “use up” the things I don’t like first, even though I don’t like how I feel in them. Some of those things, it was like I was saving them for something! Of course, there were a few items that I didn’t wear that went straight to the charity shop! But all those things that I really like got to stay, and actually a couple of things that I had been wearing went to the charity shop. The biggest lesson was that I own twice what I need. I honestly would never have believed I would only wear half of those things! I love a good wardrobe declutter! About 10 days ago I mocked my husband on a sunny day; “You’re going to have such a ridiculous T-shirt tan at the end of this holiday” to which he replied “That’s fine, I only wear T-shirts so no one will ever know” – I decided to experiment with this idea and since then I’ve been only wearing T-shirts too! So liberating to just get up and not have to think about what to wear. I have 3 grey, 1 navy and 1 black T-shirt and they go with all the bottoms I have so I don’t even have to consider that! Now I realise how much what you’re wearing just-doesn’t-matter to anybody else except yourself. (Exhibit A: husband has not noticed). The best tip I’ve ever heard is; keep clothing for the lifestyle you do have now, not the lifestyle you once had, or hope to have in the future. I can recommend the YouTube channel ‘Hello Cathy’ for help with decluttering. She does not film the decluttering process, but rather she discusses pieces of clothing she loves/has invested and why – she also just posted a video about work out clothes and resisting the urge to have ‘all the gear’. Another good channel is ‘My Green Closet’ which has really good slow-fashion content. I’m currently working abroad for a year, so have the luxury of this restriction to help me keep the wardrobe pared down! However, I have started to write down the items of clothing that are at home which I truly miss, and when I go home I will probably just donate the ones I never recalled or longed for! Haha, my husband is exactly the same with T shirts! Whereas i have tops with different straps and always seem to be trying to rotate them in summer to avoid silly tan lines. That said, I now have a big sun hat which should help! Ironically, when I moved to Australia I bought lots of new (second-hand) clothes! I think it was the excitement of being a Brit who was actually going to get to wear summer clothes! Probably went overboard, plus this was before my minimalism really took hold. Now, nearly 4 years later I’m still decluttering them! Lindsay, I think you are doing great and suggest you don’t pressure yourself to downsize your clothing until you are ready. Your idea to use the scarf is a great way to see what you wear and help you to decide periodically what you might want to get rid of. I hate clothes shopping so I tend to hold on to my clothes until they are threadbare, but I’m getting better. I have started to take a pair of scissors to items too shoddy to be seen in public in before placing them in the laundry this way I can’t keep it as anything other than a cleaning rag. Hi Lois, thanks so much for your encouragement : ) In truth, I actually do feel ready. Or *nearly* ready. I feel like I’ve been working towards this for so long, chipping away, and now I’ve turned a corner and can see the end in sight! Maybe I didn’t get rid of everything I should have two weeks ago, but I honestly feel there’s been a shift, and it IS going to happen. Even after writing this, I put two things on eBay – and one got a bid straightaway, so that’s going for sure! I have that problem too – not wanting to let go of clothes I really love. Which doesn’t make sense when overall I have too many things. I now do the same – cut up into dish cloths before I can change my mind! Lindsey- I have been obsessed with minimizing my wardrobe this week!!! I have whittled it down to 111 items, TOTAL (blog post in the works for Monday, which I will share with you), but I had never heard of project 333, how funny! Kathryn, below, says 33 per season, so is that 132 total for the whole year? I will have to look that up. But thanks for the inspiration as always!! Just came across your blog post actually! 111 sounds great! What’s next…sub-100?! I’m not sure about “per quarter” either and I don’t think it would work with the seasons here (plus I really couldn’t be bothered with it! ), but I assume some things go across all the seasons. I regularly go through my wardrobe, and the contents are getting smaller and smaller! I’m also keen on minimising waste and generally not so keen on feeding the capitalist monster. When I buy clothes, which is very rarely, I get them from charity shops or ebay, and only buy something if I feel good wearing it. I go through my wardrobe with the same idea. Ooh! Something I just thought of – maybe go through your wardrobe as if it’s the rail in a clothes shop. Imagine you don’t already own it. If you would buy it (in your current mindset – sparking joy, minimising waste, etc), then keep it. If you wouldn’t, get rid! I think I find it hard to get rid of things, because in my head I want to justify the money I spent on it. However, if it’s just sitting in my space and stressing me out, it’s hardly worth that money. And you can sell stuff, making back some of the money, and learning a lesson about what to do in the future! Sentimental things also get me, but if the person/event/whatever that it makes me think of was or is genuinely meaningful to me, I don’t need an object to remind me of it. I’m about to go travelling for an un-specified amount of time (Wahoooooo!) and I’m taking practical, comfortable clothes that I feel good in. This is not very many, making me realise what few things I actually like and need. I think it’s also important to not assign too much meaning to objects… Sparking joy to me sounds like a bit too much attachment to give an object. If you think about it, what sparks true joy in our lives is rarely an object or item of clothing. For me, I am trying to do everything with self-compassion. I’m always getting annoyed at myself for having bought something or kept something I don’t use for so long. But hey, we’re all just learning, right? Every step forward is positive, and it’s not going to help me if I’m getting frustrated about the past! This is great, thank you so much for taking the time to comment! Your thoughts on thinking about my wardrobe as a rack in a clothes shop are interesting – because I know that there are plenty of things I own that I wouldn’t buy again. Lots of my clothes are so old that they don’t really fit the person I am now, yet I keep them out of obligation to wear them out, even though I don’t feel good in them. Decluttering makes us face our truths, and it is tough! I was chatting to my friend who began the Plastic Free July campaign about decluttering last week, and wardrobe decluttering in general, and we were both saying that we don’t want to own any clothes made of plastic. Yet until I get rid of everything made of plastic currently in my wardrobe, that won’t happen. I’m delaying the inevitable. So do I do it now, or wait until it all wears out – even if it takes several more years?! Please don’t get rid of your slim clothes! I made that mistake several times. I went though, and am still going through, phases of different sizes, between college and children, and various work out videos I have traversed between five sizes in twelve years and I wish I had kept all the clothes in all the sizes. Put them in storage. Aww I appreciate your confidence in me Sarrah! After writing this I thought about it, and realised that these clothes were also my newest, although most of them were bought a few years ago. Even if I could fit into them in six months…would I want to? They aren’t made of natural fibres and they are maybe too…youthful for me now! So after writing this I decided to list most of them on eBay. I would rather someone got to wear them now, and if I do slim down I will find something else to wear! That said, I’ve kept the jeans for now. A well cut pair of jeans are definitely a keeper! I followed the idea of the capsule wardrobe but did it a bit more visually. I did a series of “outfits” on my bed and took photos of them, only allowed myself to use clothes I fit, liked and felt comfortable in and included the shoes, handbags or whatever and was quite generous with how many outfits I made up (did about 10 with not many duplication of items I think). This didn’t include around home clothes, workout, special occasions etc. I then only put these things back into my wardrobe and went from there. When you see them visually like that you get a very clear idea of what your style/colour preference is (admittedly I’m not a very creative dresser) and then any extra shopping needing to be done is probably going to be done with a clearer idea of what you want/need. When you’re wearing things you really like every day I found I developed a low tolerance to keep things that didn’t fit in with my “wardrobe” and gave/sold/donated them (most of them anyway). That’s a great idea Susan – thank you so much for sharing! I find photographing my clothes is a great way to really get it straight in my mind. How many things did you have before and after – do you know? 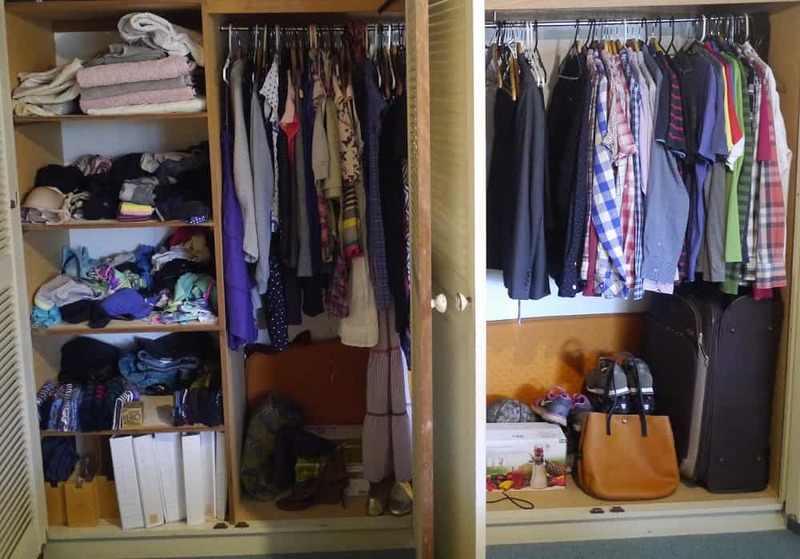 I love hearing all the different methods people have of decluttering their wardrobes!